CHICAGO — Starbucks has applied for permits to open a drive-thru coffee shop at 5601 W. Lawrence Ave., the longtime site of Brown's Chicken before the restaurant abruptly closed in January, Ald. John Arena (45th) announced Monday. "It didn't take long for Starbucks to become interested in the site due to its proximity to the Jefferson Park Transit Center and the prime intersection that is already home to Jewel [Osco], BeefBelly, Molly & Myles and Smakosz Restaurant," according to a statement from Arena's office. City transportation officials will work to "mesh" the coffee shop's operation with a $250,000 slate of street improvements planned along Central Avenue near Lawrence, specifically by "making sure drive-thru operations don't interfere" with new bike lanes, according to Owen Brugh, Arena's chief of staff. The news came as a welcome surprise to Steve O’Brien, the co-owner of BeefBelly and Molly & Miles, he said. 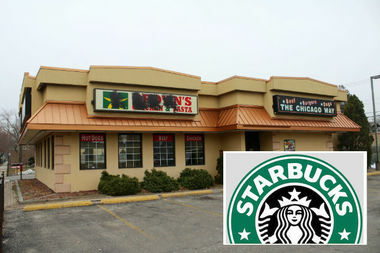 Starbucks higher-ups have not yet settled on an opening date for the new coffee shop, according to the statement. In May, a developer scored a special-use permit for the construction of a Starbucks drive-thru at Central Avenue and Irving Park Road, one mile south of the proposed Jefferson Park location. Plans call for yet another location to be built in the Six Corners Shopping District, at the corner of Cicero and Berteau avenues. That project's developer will seek a special-use permit for a drive-thru at this month's meeting of the city's Zoning Board of Appeals, Brugh said.